Challenges: Half, 10k, and 5k. More Races. More Bling. PLEASE NOTE: Registration for the following Challenges are provided for your convenience. However, you can sign up for races in the Challenges individually as long as you use the EXACT same name on each registration – our scoring program reads Jennie Smith and Jennifer Smith as two different athletes. Complete at least 3 of 4 Halfathons during our 2019-20 season to earn a beautiful Florida Halfathon Challenge finisher's medal. Choose your personalized bib number for all races and save with some great discounts! • Age Groups are determined by athlete's age on day of Shamrock Halfathon, March 15th, 2020. Staged in the tropical Tampa Bay area, all races are held 5-9 weeks apart, allowing you plenty of time for training and recovery. Join us for the 5th Annual Triple Crown by completing any combination of races at beautiful Fort De Soto Park (5K, 10K, 15K, Halfathon) during our 2019-20 season. In addition to earning three finisher’s medals, you’ll also receive our beautiful Triple Crown medal when you cross the Shamrock Distance Classic finish line – our last race of the season. The 10K - the perfect distance for the runner transitioning between the 5K and the Half Marathon. In addition to our St. Petersburg 10K, we've added 4 brand new 10K races to our well-known and loved locations. Register for all 5 and take the Florida 10K Challenge! You'll be rewarded with our beautiful Challenge medal as well as the Triple Crown medal, since 3 of the races are at Fort De Soto. Staged in the tropical Tampa Bay area, all races are held 4 – 9 weeks apart, allowing you plenty of time for training and recovery. • Earn a beautiful Challenge medal AND a Triple Crown medal in addition to 5 finisher medals – 7 medals total! Set some goals and watch the PRs roll in with our Florida 5K Challenge! The races are held 4-9 weeks apart, allowing you plenty of time for training. When you cross the finish line at the final Shamrock 5K, in addition to your finisher's medal you'll be rewarded with a gorgeous Challenge medal and Triple Crown medal (and plenty of high-fives!). – Earn a beautiful Challenge medal and Triple Crown medal for completing four 5Ks - six medals in all! Designed for athletes who would like to run or walk anywhere in the world on their own schedule and still earn one of our finisher medals. Athletes who register for the entire series virtually will receive the Challenge and Triple Crown medal automatically. Your Challenge medals will be mailed to you. To see all entry fee options, please visit the registration page. What runner doesn't like a Challenge? Sign up today and save! 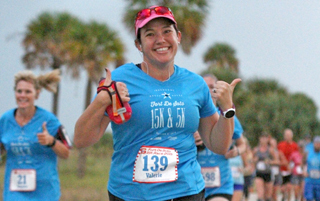 The Fort De Soto 15K, 10K and 5K courses showcase the natural beauty of this Florida barrier island. Named the nation’s #1 Beach in 2005, you'll run on flat, paved recreational trails (no sand!) with vast views of the tranquil Gulf. See course maps. The Halloween Distance Classic courses at Fort De Soto are fast and flat. Made up of recreational trails and access roads in this beautiful state park, you'll enjoy seeing the sun rise over the Sunshine Skyway. Great for setting PRs. See course maps. The Holiday Distance Classic course starts in Madeira Beach and ends at Taylor Park. You'll run through exclusive residential and commercial areas in our beach communities, along smoothly paved Pinellas Trail, and through shaded public parks. The Park Blvd. bridge adds some hill-work to your run or walk. Shuttle busses will bring you back from the finish line to the start line. See course maps. The St. Petersburg Distance Classic courses are a scenic tour through St. Pete, from the sparkling waterfront, to beautiful historic neighborhoods, the trendy downtown, and the shaded Pinellas Trail - a rails-to-trails linear park. See course maps. The Shamrock Halfathon course is exactly the same as the Halloween Halfathon course. Measure your progress from your first race to your last - perhaps you'll set some PRs! See course maps.